This is a totally, embarrassing, and awkward post for me, but I really felt like I needed to share this with you. With writing not high on the list of dreams, (or even considerations), teaching anything – let alone the word of God – seemed just as unlikely because…well…I never thought about it. A few weeks later, I received a phone call from a pastor friend of mine and he asked me to speak at the women’s conference he was having at his church that fall. There were a couple of more “unique” experiences that confirmed where God was leading, including meeting Jamie Harper in January 2011. Turns out she found my blog because – even though she is not a coffee drinker (and is seriously allergic even to the thought of drinking it) – “coffee” had been repeating to her. So, she did some digging and found my blog…not once…but twice. Turns out, we go to the same church, and God had been leading her to speak and to write too. For a few months Jamie and I met not knowing what God was leading us to do but certain that He had a plan. And guess what?! He did. And this is where it gets awkward…. This January, we have been given a great (and humbling, and completely mindboggling) opportunity to teach at the women’s conference at Valleydale Church. I’ve attached a copy of a flier just in case you’d like to see. I kind of have to slap myself when I see the fliers all of the church…it’s surreal. I’d love for you to come and meet Jamie and hopefully learn some really cool things about God. 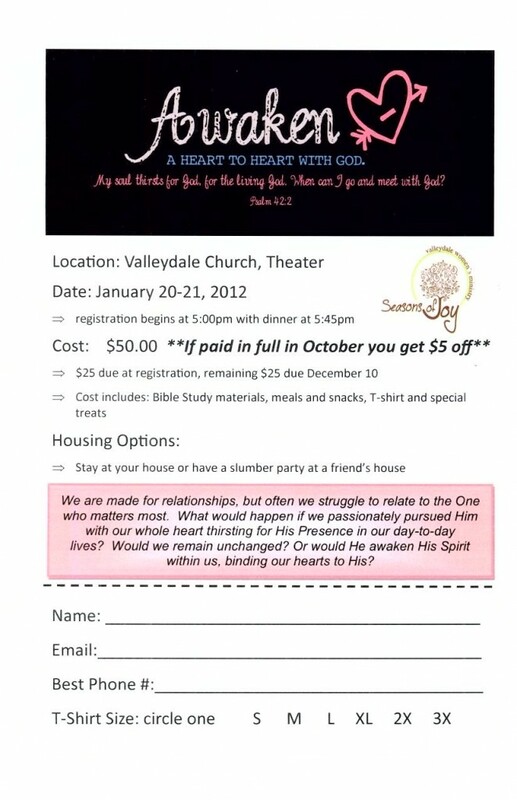 You can register by contacting the church at 205.991.5282 or you can email Amy Harris (aharrisathome@yahoo.com). Regardless of whether or not you can make it, may I be so bold as to ask you for a favor? Please pray over Jamie and I as we continue to prepare and write and check out Jamie’s blog sometime. I’m praying that God will do mighty things for those in attendance. Posted on October 31, 2011 by Nikol. This entry was posted in Random. Bookmark the permalink.